Have you been looking for a hands-on way for students to practice their addition facts to ten? Then look no farther! This pack contains 10 hands-on activities, specifically created for students to practice composing and decomposing numbers 5, 6, 7, 8, 9 and 10. 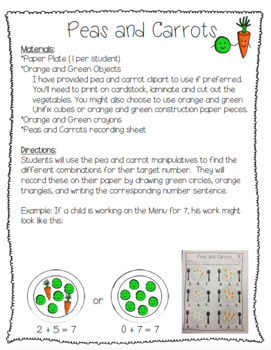 Students will be composing/decomposing and finding the missing addend in a fun and engaging way. *The directions for each game stays the same, but children will change their "target number" as they complete each fluency menu. No more giving directions for new games each week. Once children learn these games, they'll be confident and capable for the whole year. 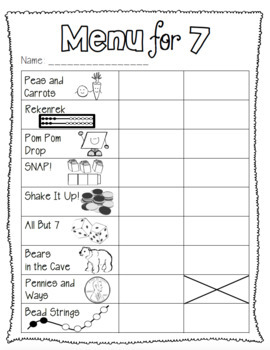 These activities can be used as whole group lessons, small group lessons, or independent activities. I've provided information for each type of lesson. 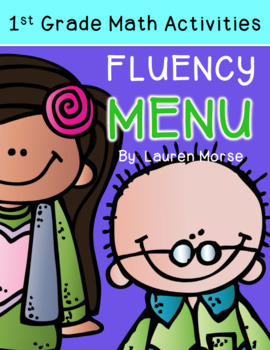 Along with the 10 activities (which are easily differentiated to meet the needs of all learners in your class), you will also receive the Fluency Menu sheets to hold students accountable, labels for classroom materials, and an optional assessment. I have also included many pictures from my own classroom to help you get everything set-up. These activities are easy to prepare and require materials that most teachers have sitting around. This will be a math choice that students can use throughout the year (with very little teacher prep!). These games were specifically created for my first grade classroom. 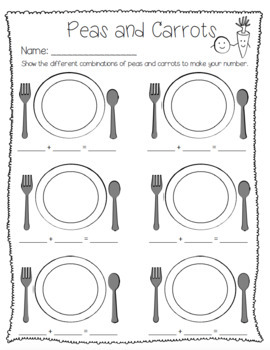 However, they would be perfect for any child learning addition facts up to 10. I've included additional pictures in the Preview.